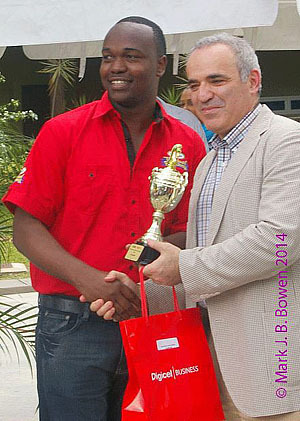 Serdon Cowan, “Kasparov impressed with strides being made in local chess,” Jamaica Observer, 6 April 2014. RUSSIAN chess Grandmaster Garry Kasparov graced the Jamaica Chess Federation with his presence at an Amateur Chess tournament held at the AISK School in Liguanea yesterday. Kasparov, who is on a worldwide tour to lobby support for the presidency of the world governing body, became the youngest ever undisputed World Chess champion in 1985 at the age of 22 by defeating then champion Anatoly Karpov and is considered among the greatest chess players of all time. Ian Wilkinson welcomes Garry Kasparov. The 50-year-old outlined that he was happy to be in Jamaica and that he applauded the efforts being put in by the local body. “I am very happy to be here, I am just travelling around the world and nothing makes me happier than to see that so much effort is being placed behind promoting chess, especially for kids. Here in Jamaica you don’t need to be Sherlock Holmes to realise the effort that is being placed behind making chess a real game. “It is quite a challenge here because Jamaica is known for many other things but chess, and having so many great names in the physical sports makes this intellectual challenge even more compelling. 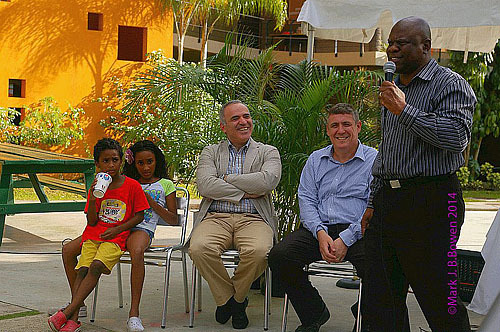 So that’s why I think it gives extra credit to Ian (Wilkinson, president of the Jamaica Chess Federation) and his team for achieving such tremendous success in bringing so many kids and making chess a big talking point and creating a vibrant atmosphere where chess can thrive,” said the former world champion. He added that he is truly optimistic about the passion that he has felt so far in Jamaica, and believes his trip to the island was worthwhile. Damion Davy receives first prize trophy from Kasparov. Photos by Mark Bowen. “It’s a short stay in Jamaica, but even these few hours [were] enough to understand the enthusiasm by chess players, organisers and those in power to promote the game of chess…all the components are here and with all these components in place I feel that something great will come from here,” he told the Jamaica Observer. Kasparov also told this newspaper that if elected president, Jamaica would be of much assistance to him in helping promote chess around the region. President Wilkinson said it was great to have a chess player of that calibre boosting the sport locally. The tournament winners were Damion Davy in the Masters Blitz, Rachel Miller in the Intermediate Rapid, Kishan Clarke in the Under-8 and Nicholas Lyn in the Under-10 division. Thank you Daaim. Got your message. Interesting days ahead! He was great champion for many years without a question. It was the main reason why when he came to New York to sign his book at The New Yorker Hotel my son tried hard to get a hand shake from him. We got as close to staring him and Michael K in the face for nearly 3 minutes waving our arms trying to get his attention, and he kept his conversation with Michael K going on as if we didn’t exist. My son looked at me and I said hold on, after another 30 sec of being ignored, I said let’s go. It was pretty clear to me that he and Michael purposely avoided us, why don’t know. I still like the guy, but that was something that any kid won’t forget. Just a small note about Kasparov’s approachability. Amazingly, a few years ago, I met Kasparov directly in Washington DC’s union station, He gave me a picture, autograph, and spent about 5 minutes asking me about physics, my chosen profession, before I politely ended the conversation so that we could return to our respective personal business (I was on my way home to my family in Baltimore). He was very nice to me and curious so I have pretty good feelings about his being very personable when on his own. In a very small good part, this has contributed to my return to playing tournament chess. It is nice to know that the top in our sport are willing to share themselves with others who love the game too. Best to you, Joshua, and your family moving forward and to Ian for his sustained and profound efforts in Jamaica and worldwide. I cannot explain what happened and/or why etc. but I promise you that I’ll ensure that Garry remedies it at the earliest possible opportunity. Of course, at a time and place mutually convenient. Please give my regards to your son. I know that you will continue to be a true exemplar as a parent. Thanks Ian! It’s a tough road ahead, but it’s one that my son willing to take on, so I am fairly confident that he will ultimately reach his purpose. I will continue to do my part as best as I can. Good luck in your partnership with Gary Kasparov.